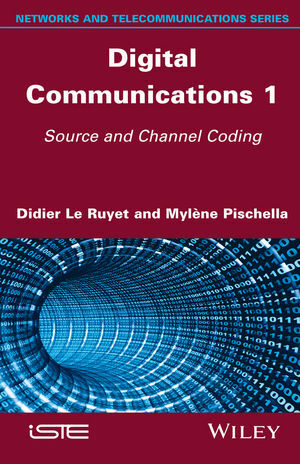 The communication chain is constituted by a source and a recipient, separated by a transmission channel which may represent a portion of cable, an optical fiber, a radio channel, or a satellite link. Whatever the channel, the processing blocks implemented in the communication chain have the same foundation. This book aims to itemize. In this first volume, after having presented the base of the information theory, we will study the source coding techniques with and without loss. Then we analyze the correcting codes for block errors, convutional and concatenated used in current systems. Didier Le Ruyet received his Eng. Degree and his Ph. D. degree from Conservatoire National des Arts et Métiers (CNAM) in 1994 and 2001 respectively. In 2009, he received the “Habilitation à diriger des recherches” from Paris XIII University. He is full professor at CNAM since 2010 and deputy director of the center for research in Computer Science and Telecommunications (CEDRIC). He has published about 100 papers in refereed journals and conference proceedings. His main research and teaching activities lie in the areas of digital communication, wireless communication and signal processing including channel coding and multi-antenna transmission. Mylène Pischella received her engineering degree and her phD in electronics and telecommunications from Télécom ParisTech. She is an associate professor at Conservatoire National des Arts et Métiers (CNAM), where she is responsible of courses on digital communications, wireless communications and information theory.